For Better - Or What? : For Better - Or What? -- The Book! For Better - Or What? -- The Book! I'm very pleased to announce that my book, "For Better - Or What?" has been released and is now available on Amazon. Thanks to everyone who supported me in this project. I would never have written this had it not been for my husband. (Naturally, the book is dedicated to him.) I appreciate the encouragement from friends and colleagues who took the time to share their comments with me, and from my fellow bloggers, who have always been supportive and inspiring. "For Better - Or What" is all about relationships - how good relationships work, and how to approach problems, disagreements and issues to resolve them in a positive way that will nurture the relationship and leave both parties better and stronger. Her section on how to avoid infidelity is especially good, with the most realistic, pointed and useful advice I've seen on the subject. 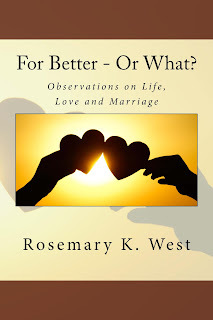 If you are looking to strengthen your current relationship, get tips on future relationships, or just want a good read, "For Better - Or What" is for you.